At T.W. Ellis we enjoy a wonderful working relationship with European Landscapes and Design especially for outdoor living space projects. 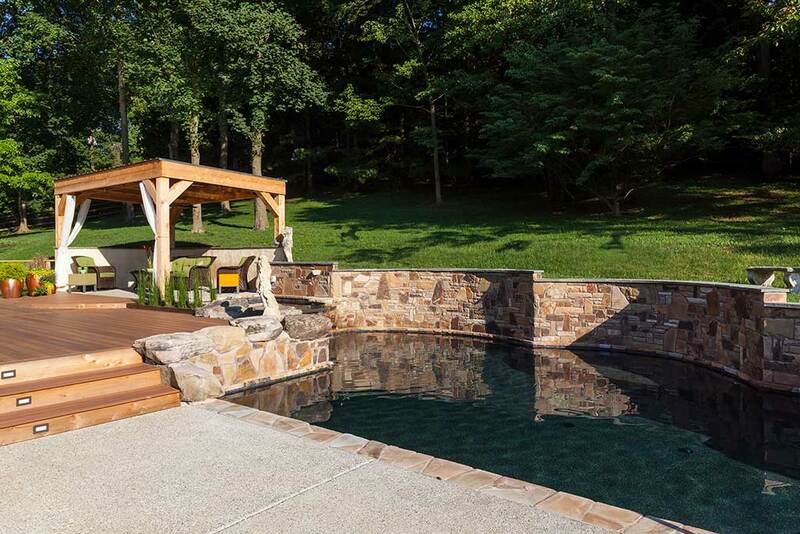 We have chosen this particular hardscape and landscape contractor as a subcontractor for several of our projects in the past, including David Wiener’s deck project that won the 2014 Remodeling Award of Excellence from the Maryland Building Industry Association (MBIA). In the same way, European Landscapes and Design often works with T. W. Ellis as a subcontractor on their own outdoor projects. Recently, we had the pleasure of constructing the deck for a stunning project designed by the landscaping firm’s talented landscape architect, Juliet Jones. The goal was to convert this run down outdoor living space into an imaginative, new environment for work and entertaining. 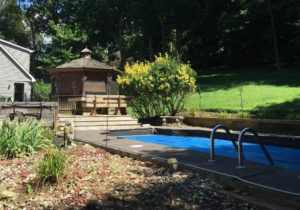 The original outdoor space consisted of a standard rectangular swimming pool, a wooden deck with a hot tub cut into it, a traditional gazebo, and a small concrete terrace around the pool. All of these features were rather run down, outdated and in need of renovation. The homeowners were looking for something imaginative, and they were open to new creative design ideas. They are professionals—one works at the local university, the other is a professional photographer. 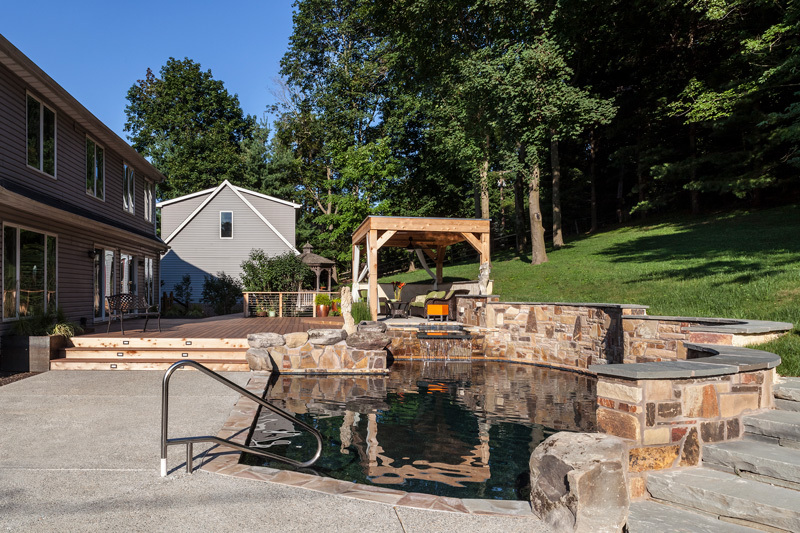 They love to entertain at home and decided to invest in an outdoor living space that would provide both a welcoming atmosphere for socializing as well as the perfect environment for underwater photography. Armed with a team of qualified professionals, this backyard transformation was taken to a new level of customization and innovation—and it’s gorgeous. Jones was delighted to take on the challenge of designing a dynamic space that would fit into her clients’ small hillside home area. In order to increase the available social space, her plans required pushing out into the surrounding hillside and opening up the backyard. This in turn necessitated building a retaining structure. 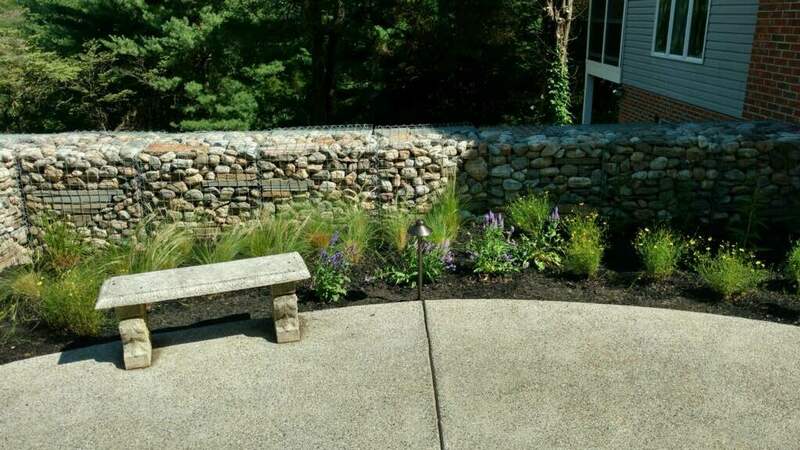 The retaining wall is a one-of-a-kind, custom-built curved layout formed with Western Maryland fieldstone and a bluestone cap that was hand-cut. European Landscapes and Design specializes in exceptional stonework that gives them an edge over other hardscape companies in our area. Their stonemasons come from many different European countries that have deep roots in the art of stonemasonry—Hungary, Switzerland, Scotland and the United Kingdom. This outdoor space also includes stone boulder steps, a deck constructed of Fiberon Horizon decking in the IPE finish, a cable wire railing, and a delightful cabana. LED lighting throughout the space turns on and off automatically, powered by solar panels. One of the more innovative features of this outdoor space is the gabion retaining wall, the first structure of this type that European Landscapes and Design has constructed. The gabion wall was formed by stacking 3 x 3 ft wire cages filled with rocks—a mix of bluestone and river stone. This will serve as a retaining wall for the new exposed aggregate concrete terrace, since the ground immediately drops down 6 ft on the opposite side. The biggest obstacle encountered when building this project was the difficulty accessing the property. The clients’ home is located on a very steep slope. The construction team created an access road so they could haul up the machinery and then dismantled and buried the road after the project was completed. In addition, this project began in the fall and finished in the summer—meaning that winter snow and ice made the access even more challenging. The clients are beyond thrilled with the finished product and they can hardly believe this amazing space is their own place to use now. In fact, they have invited the entire design and installation team to their home for a soirée to celebrate. “Overall, it says a lot about the design and install,” explained Jones with a smile, “when your clients actually invite you back and allow you to use the site, rather than wanting never to see you again.” She is looking forward to the satisfaction of experiencing all the nooks and crannies that were a part of her vision when she first designed the space. Our T.W. Ellis team constructed the custom designed deck, railing and cabana for this incredible outdoor space. European Landscapes and Design chooses T. W. Ellis for their projects because they appreciate our experience and efficiency. “Barry Ellis is great to work with,” said Jones. “He has a good eye and understanding of the overall spatial design and site restrictions. He is always eager to jump in and become a part of our team with each design.” When you think outdoor living, think T.W. Ellis and European Landscapes and Design. Together we’ll create your project to its fullest potential that you can enjoy for many years to come.